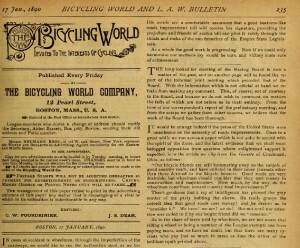 Thanks to some research I did for iPayRoadTax.com on the history of the long-gone Road Fund I discovered the cycling back-story of a number of key officials in the world of early motoring. This led to the creation of Roads Were Not Built For Cars, a soon-to-be-published history book on cycling’s critical contribution to both roads and motoring. While thumbing through an 1890s bike mag, I spotted a concept that would be taken up with relish in the 20th Century: that cyclists don’t pay for roads. Today roads are paid for via local and national taxation. Back in the 1890s, roads – in both Britain and the US – were paid for by local taxation only. 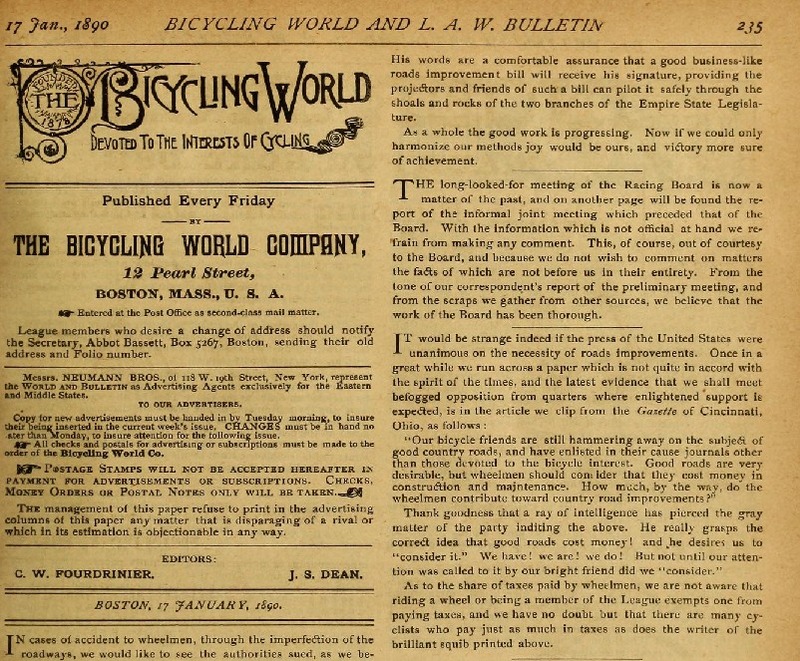 In the 1890s, cycling was the transport and leisure choice of the elite in society. It didn’t become ‘poor mans’ transport’ until the late 1920s. Cyclists of Britain and the USA used their position in society to agitate for better roads. Britain had the Roads Improvement Association, founded by the Cyclists’ Touring Club and the National Cyclists’ Union in 1886. America had the well-funded Good Roads campaign organised by the League of American Wheelmen. To be fair to the Gazette author, there were a lot more urban cyclists than rural ones, and it was largely the urban ones agitating for better roads, but the 1890s spat shows that who pays for what has been a road-related bone of contention for many years. This entry was posted on Thursday, October 10th, 2013 at 12:37 am	and is filed under No such thing as road tax!. You can follow any responses to this entry through the RSS 2.0 feed.